Image is shown with optional FracRak panel kit. This freshly updated MIDI to CV converter from PAiA is an economical and versatile solution for interfacing MIDI to the world of analog synthesis and control. It is an easy to build and use system with eight analog outputs that can be Control Voltages, Gates, Triggers, even variable amplitude pulses for triggering analog drum sets. 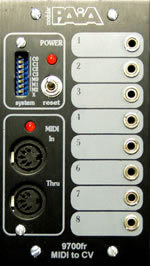 The newly revised firmware allows assignment of notes by midi channel and a DIN sync mode that can also control of one or two synths while sync is running. For custom applications, the kit is supplied without case, output jacks, power switch or transformer. Kit includes all electronic parts, circuit board, DIN jacks and DIP switch but does NOT include FracRak panel, transformer, power switch or control output connectors. Creating a modular app? Use the FracRak Accessory Kit. Building a stand alone rack? Check out the Rack Mount. Check out the MIDI to CV Converters page for more information on firmware, schematics, etc.